recommendation or endorsement of those products by the author or CA7C. Being of the electrical persuasion, I was asked by a member to put together a guide to choosing and using testers for Austin electrics. Not laboratory style instrumentation for the serious and knowledgeable, but the handy roadside type of kit. One of the handiest tools to have at the roadside is a means of checking electrical circuits and components so that you can quickly diagnose unlit lights, non-wiping wipers or sparkless plugs. This note introduces a few of the options for your toolkit, and helps you choose them. It is intentionally very basic, ‘cos frankly that is all an Austin needs! The vast majority of roadside fixes need just a very basic means of answering two questions. This needs an electrical indicator of some kind; let’s look at some candidates. This is my absolute favourite. Using nothing more than a bulb on two bits of wire, (fitted with clips for convenience), more than 90% of your roadside diagnostics can be performed. I have used this one (without replacing even the bulb) since my first moped in 1974, and it is still my first port of call. It has a 12V bulb for working on 6V circuits (deliberately – bear with me) but has been used very happily on motorbikes, old Landrovers, Allegros and of course the Sevens. Very simply, it is used to decide if there is power (it lights up! ), there is something connected in series between it and the battery (it is not so bright) or there is either no power or it can flow around the bulb through a circuit (It doesn’t light up), or a connection is intermittent (it flickers). That’s all you need. Also, it doesn’t matter which way round it is, unlike a meter which must be the correct polarity with respect to Earth. Whilst you can’t use it to check a fuse or a bulb without a power source, you’re standing next to your Seven, and that has a battery. 2. The Analogue (or moving) meter. Again, cheap, simple and plenty accurate. The one drawback is they are a bit more fragile. Even so, a cheap meter will be good enough for any Seven task, including more complex activities such as ignition timing and setting the gap on the points. 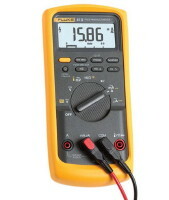 The speed at which the meter can respond means that you will see an intermittent connection as a flick of the needle, which can be very handy. Be aware though, that all meters that have a resistance (or “Ohms”) range have a battery in them, which will go flat and manky when left for years under the back seat. I tend to leave the battery out but handy, as the volts range doesn’t need it. 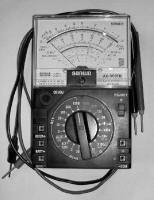 A word of caution: these meters have Current (mA) ranges as well as Voltage ranges. Unless you have very good reason to need to know the magnitude of a current, and you know in advance roughly how big the current will be, stay clear of the current ranges. If you try to measure how much current your headlights take on a milliamp range, (or worse still, you accidentally connect the meter to the car battery), the brief outpouring of smoke will inform you that a replacement meter will be necessary. Oh, and when the battery goes flat, they are of no use whatsoever. 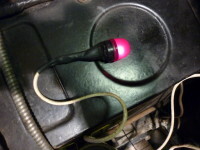 An example: checking the coil and the points in the ignition. We all know the circumstances. We’ve primed the fuel pump so we know there is fuel. We crank the engine and fail to be rewarded with that silky purr associated with the Seven engine. (Wishful or what?) This is a perfect job for the bulb or the analogue meter. The bulb has the advantage that it can just dangle out of the way and you have both hands free. 1. Connect one side of the bulb to a good earth. If not too hot, I like to use a cylinder head stud. 2. Check that the ignition system as a whole is getting power. Connect the bulb / meter to the SW terminal of the coil. Should light up / read 6V / 12V as appropriate. If not, that’s your problem – look for a broken wire. 3. Connect to the CB terminal of the coil, and SLOWLY turn the engine over on the handle. i. The lamp goes on and off / the needle swings, all OK on the low tension side and through the points. ii. The lamp lights and dims but does not go out: clean the points. iii. The lamp goes out and STAYS out – either the points have closed up or the coil is open circuit. Check by disconnecting the wire to the SW terminal. If the bulb relights, then the points have closed or there is a short near the distributor. If the bulb stays out, the coil has failed open circuit. iv. The lamp lights and stays lit there is no connection through the points, or the distributor has lost its earth connection (the baseplate screw is a prime candidate for this on Lucas distributors). Check the wire between the coil and the points for breaks, and clean the surface of the points. Check the baseplate screw through the Bakelite is clean and snug. This article, by Geoff Hardman, originally appeared in Seven Focus, August 2015 pp25-27.